Coming home to Canada has been adventurous in ways I never thought would happen: polar bears, beluga whales, jazz festivals. I certainly did not think I would learn Hindu wedding traditions in Canada. But my sister’s friend was getting married and it is customary to invite the entire family so I jumped at the opportunity to be my mother’s date – even though I’m not a fan of weddings. I have never wanted to get married. I have never pictured myself in a white wedding dress. It’s not that I want to become a lonely old maid traveler. I do want a relationship but the thought of love, honour and obey make me flinch and the sentiment of getting married gives me anxiety. But Hindu weddings seem to be less intimidating. From the start I was impressed, instead of an unflattering white dress, the bride wore a gorgeous ruby dress adorned with gold. The father did not walk her daughter down the aisle but she was accompanied by her closest friends. The wedding was held in the backyard of the bride’s family. Some sat in chairs and some on rugs on the ground, which is far more practical if you have dragged offspring there. Not surprisingly, this was the first non-Christian wedding for the majority of the people attending – including the groom’s family. Instead of performing a ceremony most would not understand or appreciate, the university professor officiating spent time explaining the significance of each element. It was nearly 2 hours but there was a lot of joking and laughing, making for a really wonderful afternoon. After the groom placed a necklace on the bride and exchanged rings to symbolize “winning” each other. They exchange vows. The vows were the most practical I have ever heard. He asks for her commitment, to value his family and to be his friend always. She asks that he stand by her and consult her in all matters of finance, investment, religion, charity, and buying/selling of items. She also asks that he be her friend and protect her. Making an agreement not to keep secrets about money? That is something I can understand. Most importantly she asks that he does not use harsh words or ridicule her in front of others – I have met some married couples that should have taken this vow. One of the more interesting aspects was the 4 posts of the gazebo were manned by each of the ‘brothers’ of the family to symbolize they still support the bride even after her marriage. The bride then follows the groom four times around a fire in the center and then he follows her three times – humorously told that in the beginning the groom thinks he leads the marriage but soon realizes he needs to follow whatever his wife says and does. The upper cloth of their clothing is tied so they stay in step with each other around the fire and in life. If one walks too quickly the other needs to speed up and they need to slow down. Throughout the ceremony there were elements addressing loyalty to family, remaining friends and to working together. It started to make marriage seem less like a soul-sucking prison sentence. In the end as the guests threw flower petals on the newlyweds it felt like a celebration of a life partnership instead of the crushing end of youth and isn’t that what it should be? Maybe I won’t discount getting married after all. Love it. lovitloveitloveit. Behind all the jokes and hostile commentary, I am quite the hopeless romantic. Wow I had no idea ,I like the vows. I know no matter what kind of marriage it is to be I feel no matter how the vow is worded or said I would still commit everything to my partner I mean that’s what a marriage is about and if you aren’t why would you? The one thing I like about the vows yo described is so much more simpler than a christian marriage vows. I wouldn’t renounce my Christianity but this is a cool way to get married IMO so I’m curious now how a Christian can get married under hindu beliefs? Is that even possible? I’d totally get married this way! Considering we’re from a small town on the East Coast I would assume the groom was baptized Christian. 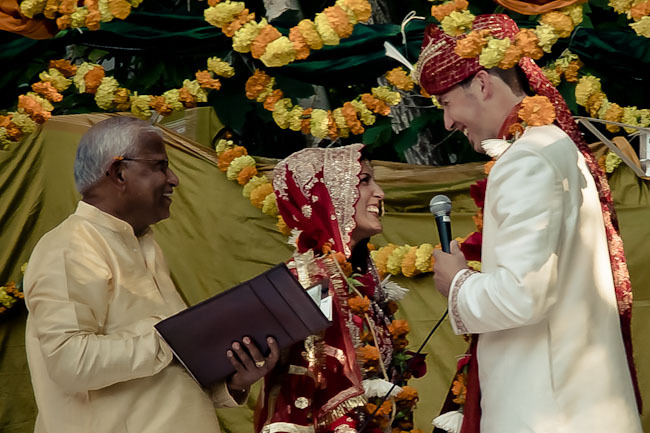 So I guess you could be married under Hindu beliefs – although I am sure the people officiating would like you to continue with the Hindu beliefs. Thank you so much for commenting as I had a lot of questions about that. Makes me like Hinduism even more that it isn’t divisive. I was married over thirty years ago in Amritsar. I had heard this too, that one couldn’t convert to Hinduism. But my marriage was Arya Samadhj and that ceremony covers mixed marriages, I was told. I consider myself a Hindu Advaitist. I guess the “default’ covered me because I lived for twenty years in Bombay as a Hindu and signed hospital documents as such. And still do in America. Wow, that is a really beautiful ceremony and equally beautiful sentiments. I always loved the colors I saw in images of a Hindu wedding. I really like the last shot, they look so happy. I’m glad you got to experience that-because I know you’ll make a great partner to someone someday. And of course the wives run the show,they just let the husband think he does! I love this story! Well if the wives run the house I may reconsider! I agree. I think the vows are spot on. It was good that it was all explained to the guests as well. Made them feel part of it even more. Lovely. It could have been a long 2+ hours if I didn’t know what was going on. I wrote an article for bootsnall about wedding traditions of the world, (10 ways to tie the knot)naturally including this one. I love it too, it’s romantic and down to earth at the same time. I once was invited to a very upper class hindu wedding in London, where the groom arrived (veiled) on horseback. It was like a movie. So, Ayngelina, did you get inspired?? Is the wedding bug biting?? Ours arrived on horseback as well, although it looked rather odd in the small town subdivision! Even if the wedding bug were biting I’d have to work on the boyfriend bug first! Hmm, someone seems a little bitter about love and a little down on relationships…however, this is a beautiful ceremony. I like the practical application of the vows and hope they stick to it. The wedding day is the fun part. It’s every day after that where the real work happens. So true, a lot of people get so caught up on the wedding details they forget there is a marriage after it! That’s what I, as foreigner (not anymore I guess but still) in Canada, find amazing about Canadians, still, almost 2 decades later, acceptance, tolerance and understanding. With this I’m not only talking about all other guests (Christians) present at the weeding but you as well, the way you write about it is to me “so Canadian” – I see in your words every Canadian I ever meet and spoke to. Also, fact that this took place in rural town (if I understood correctly in between lines of one comment above) speaks even more about it, since around the world, in most of the cases, rural equals traditional and conservative (but again, there are always exceptions to the rule, anywhere we go). It was really wonderful to see the neighborhood come together and embrace a new tradition. Those that were close to the family borrowed saris and everyone had a wonderful time. And this is a town of 5000 people. I guess I’ve never been drawn to them and once I found out how much my friends paid for them all I could think about was how long I could travel with that money! I LOVE this! I’m not super keen on marriage (my parents are divorced and thus, I’ve never really seen the point–much more about having healthy and supportive relationships!). Plus, I feel like weddings these days are all about the DAY–not the many days that come after it, aka the marriage! I really like the practical vows and the laid-back nature–and being walked down the aisle by your closest friends. Side note: my mom wore red on her wedding day–it’s common in many Eastern cultures because it symbolizes happiness and prosperity! I completely agree with you, there is so much stress about making it a perfect day and everyone forgets what it’s really about. Funny – I went to a Hindu wedding many, many years ago at the Beverly hills hotel. I had no clue what was going on….thanks for finally explaining it to me! One of my good friends saw one in India but didn’t understand any of it because everyone already knew! Me too, the more we share our traditions the more we see we aren’t so different. I love everything about this. It’s basically everything I love about marriage. Friends. Commitment. Happiness. The practicality of their vows. I love it all! Me too, feels more like a partnership that will last. I wish we had been able to be there but we were in NL. I saw the bride yesterday and she quickly told me how wonderful it was…thank you for sharing the pictures! As soon as I saw everyone I knew I had to write about it, so beautiful. I feel exactly the same as you about marriage – which is why Kali and I have made the conscious decision to remain unmarried, even after nine years together. Unless some ridiculous disaster comes up where being married is the only way to solve it (health issues, finances, immigration) we’ll stay unmarried even if/when we have kids. And most wedding customs drive me batty — the bride being “given away” from father to husband, the white dress and what it signifies, the rings (traditionally showing ownership or being “taken”), being expected to change your last name, etc etc etc! It’s nice to see some of those things turned on their head, both in a different cultural context and by folks who want to do things differently. I know so many couples who have been together for decades but never married. The commitment is more important than the ceremony. Great post. Hindu weddings are the best! When I lived in Guyana, I attended a number of them. The seven curries rock. Nom, nom, nom…. Oh don’t even get me started about the food! I was a bridesmaid in a friend’s Hindu wedding this past April in Toronto. 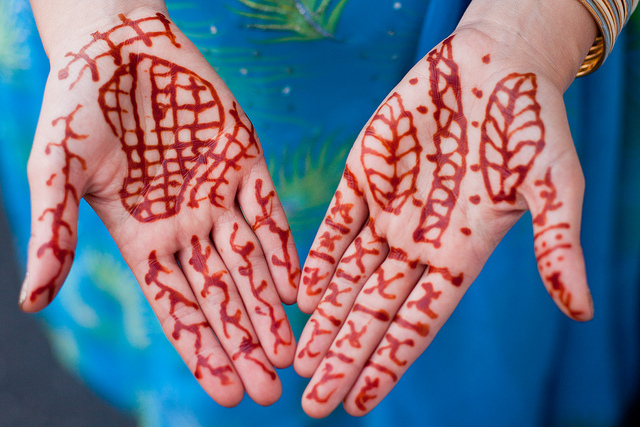 It was a beautiful 3-day (yes) celebration and I was decked out in a sari, a bindi and had one of my hands decorated with henna. I too loved the sentiments expressed between the bride and groom and their families. So lovely! Jealous that it was only 2 hours for you and you knew what was going on. Myself and a couple of friends were the only non-Hindus in the audience. Even without the explanation it was beautiful, but I am thankful I knew what was going on. Sounds absolutely brilliant! Mulan and I have discussed marriage and our plans definitely follow such sentiments namely a commitment to be friends and always support but none of that obeying malarky – who obeys anything these days anyway? So basically how do I qualify? That’s the wedding I want although on a beach somewhere like Zanzibar. I hope the happy couple have many years of happiness together as they look properly happy together from your pics. I wasn’t sure but another reader here commented that everyone is considered Hindu there’s no conversion so I guess all you need to do is find someone to officiate! I went to the Hindu wedding of a best friend two years ago and had the time of my life! It was 3 days of nonstop color, delicious food, dancing, and general merriment. And I must say, a sari can do wonders in making a girl feel beautiful! The saris were so gorgeous, a lot of the family members wore really beautiful jewel toned ones that I would love to have. Lovely pictures and a great look inside of much different wedding traditions than I am used to seeing. I went to a wedding in India years ago and it is still such a powerful memory for me. I’d love to attend one in India now that I understand the ceremony. “A soul-sucking prison sentence”Now there is a statement I will remember.Loved all the bright colours and the family all around.See, it doesn’t seem to matter what the wedding is like , but it is very important to have your family and friends there to support you! !Life will always be all about family and friends!!. But where’s the elephant? Seriously, absolutely gorgeous! I’m DYING to attend an Indian wedding in India. Well the groom rode in on a horse, a substitute maybe? I went to a Muslim wedding which was actually a 3-day affair. It was amazing! I’m a big fan of incorporating your own culture into your wedding and really making it your own. The traditional white weddings seem so boring after experiencing an event like this, don’t they? I believe the entire Hindu wedding experience is 4 days, my sister is close to the family so she was at their house quite a bit. I would love to attend a Muslim wedding too. If you get the opportunity to go to one you’ll love it. Pass on the post and she’ll get the hint! I love this post! I love all the colors and the actual celebration that takes place. I told my daughter I want her to have a wedding like in India. Well it could be possible! I certainly think it’s more beautiful and practical. What a cool ceremony! I like these vows since they seem really practical. Actually, anyone can incorporate these elements in their own wedding. We had a friend officiate at our wedding and planned our entire ceremony using how-to books, picking and choosing elements. It’s not too difficult! The coolest I’ve been to. Beautiful piece. The fact that I’m already once bitten, twice shy at the thought of marriage, this makes even me rethink things. Yet another reason for me to look forward to India. I have no idea if I will ever get married but I had never wanted a wedding before, but now I’m on the fence. I was directed to read your blog by Neera, mother of the bride. I am so happy that you documented the many parts of the ceremony. It brought back why I loved it so much. I tell people it was an “experience” and it is not so easy to explain but you have done a wonderful job for those who did not feel the day!! Thanks for your writings. They brought back the day to me again. My son Justin, is one of Sanjeev’s best friends and so I have been a part of their extended family for years. But, that being said I never truly experienced the Hindu religion until that day. I am a practicing christian and was touched by those vows. They really explain what a successful life as partners really means. I was so honored to be a part of that day. I’m so glad you took the time to stop by. It was such a wonderful day I’m so happy that you think I captured the moment. This is very practical approach that I agree makes a lot of sense. In the end, though, it’s the love and commitment of the couple that will determine their future happiness. Red, symbol of passion. You can’t go wrong with a red wedding dress! Wishing the couple much joy and a long future together. This wedding is so beautiful and seems very friendly and more intimate. I have been to Chinese and American style weddings, and gawd they had nice food and dresses, but the whole wedding day rituals and ceremony was very long and really tried my patience. I don’t want to get married but I love the sound of a Hindu ceremony. I think everyone who wants to get married should have the wedding that’s right for them. 🙂 My cousin got married in December and decided to cut all the traditional hoopla like speeches, etc. because she wanted everyone to feel comfortable. After the photographs were taken, everyone went inside for a round of afternoon tea! Love it. It sounds lovely! I especially like the vows (and agree with you that some people really could do to remember those sentiments). I LOVE Hindu weddings. Or, at least the idea of them, since I have never been lucky enough to attend one myself. They are so colorful and full of life. Looks like a great afternoon! Perfect Hindu wedding! Well described, its all fine!! This sounds like such a lovely and beautiful wedding. I would love to attend one like this. I love the idea, color, and aura it gives out, and as always, your pictures are beautiful. Even though I’ve witnessed weddings from a variety of religious and cultural traditions, never really considered incorporating elements of them. Way to own the Hindu ceremony! Indian dresses are super beautiful, I must agree. 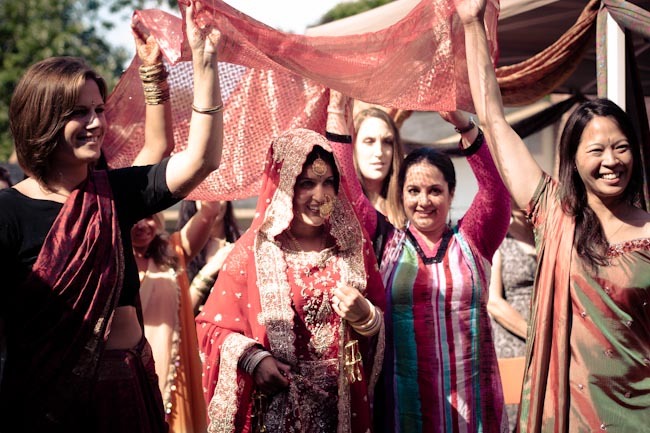 I’m a Civil celebrant in Australia, here civil ceremonies differ legally from any where else in the world and I think thats great but the Hindi wedding is just so beautiful. Sadly because Hinduism is not an organised religion their ceremony is not legal in Australia… they must also have a “legal” civil ceremony, thats where I come in and I consider myself so fortunate to be able to attend their traditional ceremony and the perform the legal one. This sounds/looks beautiful. I bet it was a lot of fun. You should totally have a Hindu wedding! “In the end as the guests threw flower petals on the newlyweds it felt like a celebration of a life partnership instead of the crushing end of youth and isn’t that what it should be?” It should indeed, that is why for my wedding we rented a party bus and celebrated St. Patty’s day in style. Hope if you ever get there yours can be a celebration too. Wow, thanks for this post. It’s not like you can read about an intercultural Hindu wedding through the eyes of a westerner every day! 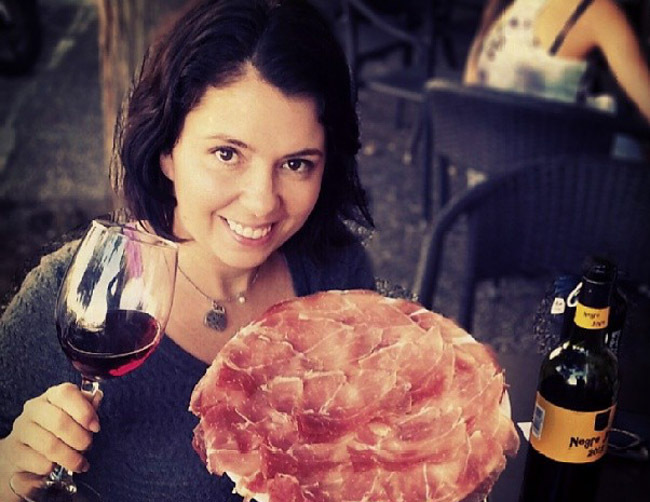 It looks like a great experience and a very meaningful ceremony that is easy to relate to. Great that you got to be part of it. I am sure the wedding you are talking about was held during day time but if you are in India whole night the same process continue but yes, few times day time too. Since childhood I have attended many. It was always exciting to receive a marriage card and then on the marriage day visiting and spending whole night there till Shaadi(marriage) is done. Anyways, wonderful and blessings for couple. Thanks for writing and sharing. I really enjoyed this post. The Wedding does look a lot less awkward then a traditional Christian one. Love these vows. I am a wedding celebrant, and I’m going to try to incorporate some of these into my vows. Thanks! Our weddings are fabulous! 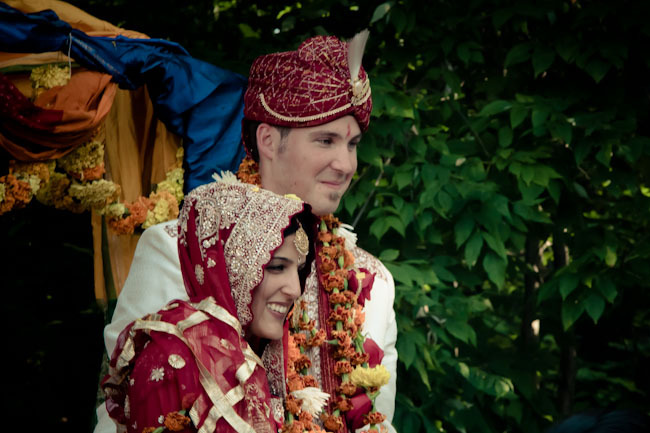 But depending on where the bride and groom are from in India, the traditions are very different. Two hours is quite short for a Hindu wedding especially when having explanations. Most are 4-5 hours and are extremely detailed. Still, I loved my wedding because it was full of traditional and color and fun! I heard that two hours was short and that in traditional weddings it is very common for people to get up to eat or even fall asleep! I have been to quite a lot of Hindu weddings. Actually there are a number of sects in Hinduism and all of them have different rituals for wedding though most of these rituals are common in them. Mostly Hindu weddings happen in night and it’s 4-5 or even more hours long. And the number of days also varies from 3 to 6. And in some sects it goes for even months. Like they will have this ‘saggai’, then ‘chekka’, then ‘sangeet’, then ‘haldi’ ’tilak’, then ‘saadi’ (the actual wedding day/night. And there are different ceremonies/rituals to be performed at the houses of the groom and the bride. And the color and food is just incredible. Yes, I should say that the wedding activities went on for days, my sister was at the house a lot for different things. I’d love to participate in all of it. Our son is getting married to a wonderful Hindu woman in September. I happened on your site whilst being curious about the Hindu wedding ceremony. It’s very informative and I have sent it to the family for education and insight into this amazing ceremony. It will be an amazing time, I hope who officiates it explains all of this to you as well. Wonderful account. I was married in this same ceremony almost forty years ago in India. It is Arya Samadhj … a Hindu ceremony used often for mixed marriages when husband and wife are different castes or branches of Hindism. As I sat under the mandal … my sister-in-law translated the ceremony from the Sanscrit to English. I was unprepared for the beauty of the ceremony. I had merely asked that the “obey” in the Christian rite be omitted. And my sister-in-law had laughed as she assured me it definitely wouldn’t be there. We had 1000 guests and blacked out the suburbs of Amritsar twice as we added more lights. It went on for hours and we celebrated with parties for weeks afterwards. My Indian family adopted me as a very cherished youngest member … and today my love for them still gives me goosebumps. My website has many stories of my India years …. with more to come. Whether or not someone can convert to Hinduism is hotly debated. Some say you must be born Hindu and reincarnation allows for you to be Hindu is you were supposed to be. Some temples and lineages do have conversion rites. I consider myself to be a convert to Hinduism and I find myself in this discussion frequently! I consider myself to be a convert to Hinduism and I find myself in this discussion frequently! I believe anyone can become a Hindu if he or she wants.